I use Chocolate Banana Nut Paleo Protein from Rootz Nutrition. Use my code REDDOOR10 for 10% off your order from them! 2. In a food processor or blender, add all ingredients except the optional add ins. Pulse until liquidy. Stir in extras here. 3. Use a non-stick item of choice (butter, coconut oil, avocado oil, etc.) to grease your pan. Pour batter into pancake sizes of your choice. I made 6 small-ish pancakes out of this recipe. 4. Cook for about 3 minutes, or until tiny bubbles form, and flip. Cook another 1-2 minutes and remove from heat. 5. 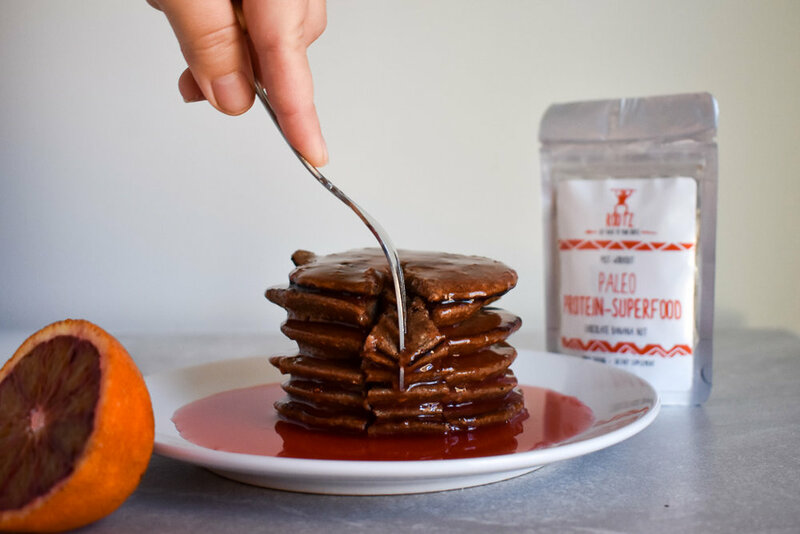 Make your blood orange syrup by bringing your juice to a boil in a small sauce pan and adding in your thickening agent (cornstarch or arrowroot starch). Remove from heat and whisk well, until it thickens up. Pour over pancakes and enjoy! These are low sugar and a great source of protein. They will keep you full until lunch! My batch contained 15g of added protein from the Rootz Nutrition powder. 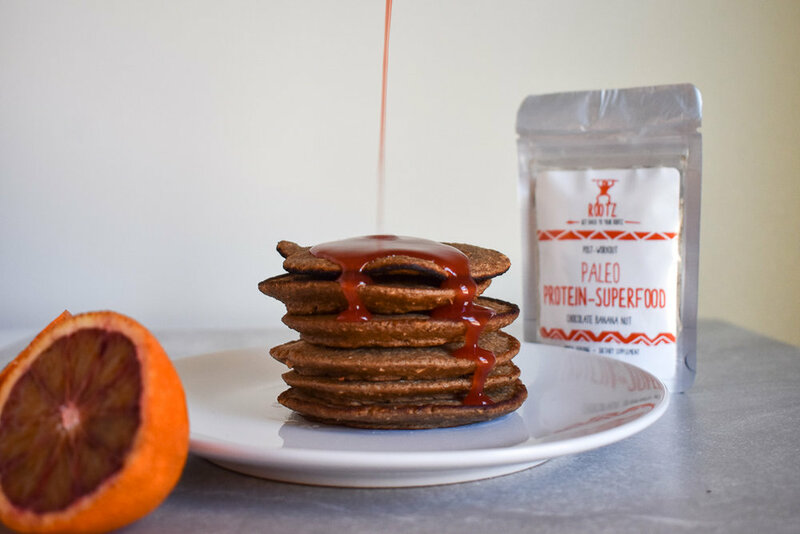 The banana in the pancake and the juice from the blood orange adds the perfect amount of sweetness. Yum!